Sleep deprivation… UGH. There’s a reason it’s commonly used as a form of torture! When your baby won’t sleep and you can’t get more than two or three hours of shut-eye at a time, it can feel like your whole world is falling apart. You’re exhausted. You can’t think straight. Your nerves are completely frayed. In other words, you’re not exactly at your parenting best. And your baby isn’t at his or her best, either. When babies don’t get a full night’s rest, everything is harder for them. They are fussy and cranky all day. They don’t eat right. Learning basic skills is more challenging. Sleep deprivation just starts to take a toll on the whole family when your baby won’t sleep. I used to have a lot of trouble getting Brianna to sleep well at night. For months, she’d go to bed really late, then wake me up four or five times a night, demanding to be fed back to sleep. It was a nightmare! She was cranky, and I was sleep-deprived and exhausted! I kept asking myself “Why won’t my baby just sleep?” Through the midst of all my crazy research on how to get her to sleep through the night, I came across the Sleep Sense site. It’s run by Dana Obleman a professional sleep coach who created the Sleep Sense Program. I started reading, and a lot of the things she was saying described to a T what was going on with Brianna. So I immediately took the free customized sleep plan. I have to be honest, at first I was a little bit weary about this site, and the way it is advertised, sort of “sales pitch” style. But I am so glad I tried her methods. The first night it took Brianna 1 hour to fall asleep on her own, by the 3rd night we were down to 5 minutes. Brianna was a very difficult case at 8 months old, with many sleep associations, and Dana’s methods worked wonders for our family. She uses a very gentle and effective approach. If you have been reading my blog you know I’m totally against CIO, this is why I highly recommend it. Besides, I would never risk losing credibility on my blog by posting about some bogus program. It’s really hard to trust any program guaranteeing your baby to sleep through the night, but at least this one will give you your money back if your baby doesn’t. I’m also Dana’s friend on Facebook and have seen a lot of really great comments about her sleep training methods. Those are real people on there and real comments, no marketing and no gimmicks. 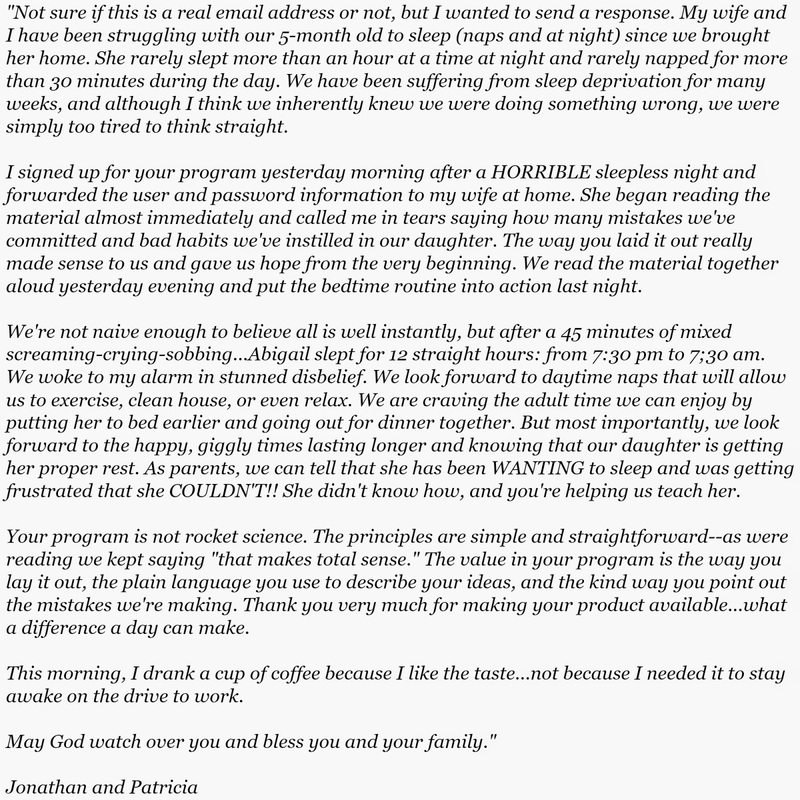 And as you can see from the testimonials and success stories on her site, she’s obviously helped a huge number of families finally get a good night’s sleep! Here is a comment a Father…yes a Father posted on her page. It’s kind of long but I just had to share. Does the sleep sense program make you use the cry it out technique? Absolutely not. It talks about tears realistically because there will be some tears since you are changing your baby's routine. But the program teaches you exactly how to respond. 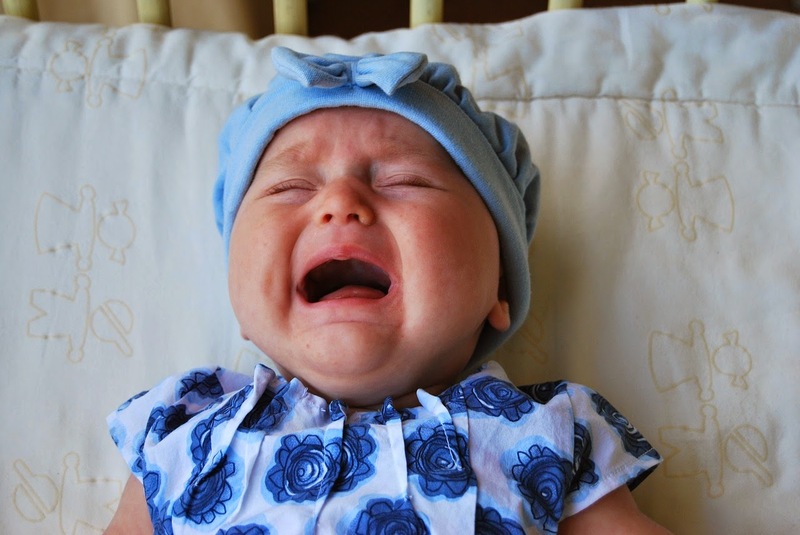 The program does not make you leave your baby to cry it out. Good luck! My son is 8 weeks old now and is having trouble sleeping at night. I started a bedtime routine around 5 weeks of bath, pj's, bottle then bed. He usually sleeps 3 hours once put down but after that he can wake every 45min to and hour and I dont know why. I let him cry a while to see if he goes back to sleep but this never works he always continues to cry and gets hysterical. So I pick him up and rock him and he falls asleep again after 5-10min. I do still do two night feeds but he is waking now 6-8 times in the night which is crazy. I dont know why he is waking so often and would like your help on how to get my son to sleep longer at night without waking. Have you tried swaddling?? Doing that helped my baby sleep through the night. She was waking herself because her arms were flailing and she didn't feel secure.